This ‘weed’ (Achillea millefolium) is found in many pastures throughout New Zealand and is drought tolerant with deep rooting structures bringing nutrients and minerals to the surface in its foliage. 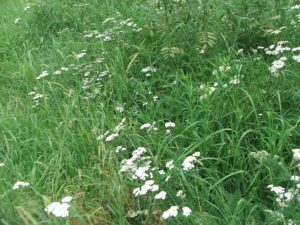 Don’t be too hasty in removing it from your pastures.Yarrow is used extensive in herbal ley mixes for livestock and in orchards. It has a number of valuable therapeutic actions not least having the ability to ‘starve’ tumours of nutrients. Essential oils, azulene, borneol, camphor, cineole, terpinole, euginole, thujone, lactones, flavonoids, tannins, coumarins, saponins, achilleine, salicylic acid. The azulene is responsible for the blue essnential oils that are extracted from the flower heads and these oils command thousands of dollars per kg. Has anti-angiogenesis properties. (Angiogenesis is the point at which a cancerous mass forms blood vessels to reduce oxygen and nutrients) So it cuts off blood supply and oxygen to the ‘tumour. Flavonoids in yarrow flowers encourage circulation, lowers blood pressure. Active ingredients strengthens vascular walls. Thujone is one of the active ingredients in yarrow may be used to treat warts and sarcoids. Thuja is a recognised wart herb with its main active ingredient being thujone. The plant extract may help relieve urinary tract infections and stones. Used internally and externally for the treatment of sarcoids. Between 1 and 2 tsp of yarrow daily for average sized horse. Treatment for sarcoids are usually around 6 weeks. Often at that point the sarcoid will elongate and may even weep then spontaneously drop off. 10ml of yarrow may be given for the first few days after sustained injury and in particular if internal bleeding is suspected. In the case of horses 5ml daily during the recovery stage while there is a risk of proud flesh development. 10ml the night before an event or race and 10ml on race day will help with nose bleeds. A maintenance dose of 5ml daily will help strengthen capillaries in the nasal cavity. 5ml daily given with feed may help with stomach ulcers. Yarrow may be added to a warm lemon drink to help lower blood pressure. May be used as part of an integrated medical approach for cancers under the guidance of a qualifies practitioner. May help reduce inflammation after muscle strain. Suitable for people that suffer from nose bleeds. May be used in conjunction with yarrow to improve blood circulation to the brain and extremities.